FUEL EFFICIENT 30 MPG Hwy/22 MPG City! LOW MILES - 7,434! Keyless Start, Onboard Communications System, Brake Actuated Limited Slip Differential, Smart Device Integration, iPod/MP3 Input, Alloy Wheels, Back-Up Camera, Turbo CLICK NOW! Back-Up Camera, Turbocharged, iPod/MP3 Input, Onboard Communications System, Aluminum Wheels, Keyless Start, Smart Device Integration, Brake Actuated Limited Slip Differential Rear Spoiler, MP3 Player, Keyless Entry, Steering Wheel Controls, Child Safety Locks. CHARCOAL BLACK, CLOTH SPORT SEATS W/UNIQUE ST LOGO 6-way manual driver seat (up/down, fore/aft, recline), 4-way manual passenger seat (fore/aft, recline) and 4-way manually adjustable driver and front passenger head restraints. 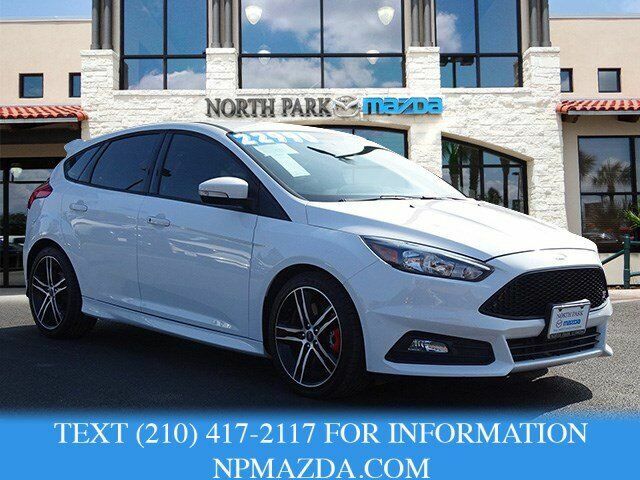 Ford ST with Oxford White exterior and Charcoal Black interior features a 4 Cylinder Engine with 252 HP at 5500 RPM*. Edmunds.com's review says "Ford has tuned the suspension masterfully, imbuing even this economy-minded model with a playful, light-on-its-feet character.". Great Gas Mileage: 30 MPG Hwy.